Training Industry continuously monitors the training marketplace looking for the best providers of authoring tools. This eighth annual list is designed to help buy-side organizations in their searches for the right training partners. Due to the diversity of services included in authoring tools, no attempt is made to rank the top companies. Articulate Storyline is a tool for creating interactive courses and content. Articulate Studio is an easy way to create courses from PowerPoint content. Both publish to Flash, HTML5, and iPad, so learners can access Articulate courses on nearly any device. Brainshark provides award-winning content authoring tools and sales enablement software for an always-ready sales force. Any businessperson can easily create, update and deliver engaging sales learning content that’s available on demand and powers sales effectiveness. Dashboards track learners’ progress and give a holistic view of team readiness. To help with dull online learning, Growth Engineering created Genie, our stand-alone content authoring tool that lets users easily build game-based learning content. Genie is the latest weapon of mass instruction that lets all our clients engage their learners and create training that they’re excited for! iSpring Solutions, Inc. is an international software company focused on providing cutting-edge software for e-learning. iSpring products are used by over 18,300 companies and 1,800 educational institutions worldwide. Founded in 2001 and headquartered in Alexandria, V.A., iSpring is committed to developing high-quality products for knowledge sharing. There is no other tool designed for educational market that offers their users so many important features. We believe in an egalitarian education with access to knowledge for everyone. Our software allows you to create accessible, adaptive and responsive courses with the biggest amount of easy-to-implement interactivities. Area9 Lyceum builds 21st-century skills and competencies through the world’s first four-dimensional learning platform, Area9 Rhapsode. Based on more than 20 years of research into human factors and cognition, our AI-based authoring, curation and delivery platform delivers truly personalized learning at scale. dominKnow continues to push the boundaries for what modern e-learning authoring tools can do. By efficiently creating more than just e-learning in one integrated system, authors have the power and flexibility to create almost anything they want for any formal course, performance support, or microlearning need. This lets authors do more, faster. Xyleme is the learning content management platform for visionaries who understand that learning content is an asset and are looking for innovative ways to change the way learning is created and delivered. Our platform is for companies that have complex content, helping them author, publish and deliver learning content efficiently. Elucidat makes it faster for global organizations to produce e-learning that delivers real-life impact. This reduces training costs, simplifies the process and makes it easier to scale. They are fueled by a team that offers unparalleled support and guidance to help their customers. The Thinkzoom LMS is built to provide the most needed features in an easy, mobile-friendly, intuitive interface incorporating social and gamification throughout. Thinkzoom provides a number of tools for sharing company-specific knowledge and content, enabling organizations to seamlessly incorporate their own company’s personalized training packages. Adobe Captivate empowers you to create fully responsive e-learning content with a smart authoring tool. Design modern immersive learning experiences using VR and 360° media assets. Record software simulation from scratch or add interactivity to existing PowerPoint slides and videos to create engaging e-learning that works across all devices. Intrepid's award-winning collaborative learning technology helps global companies and organizations develop people to solve big business challenges. The Intrepid platform offers an elegant, collaborative learning experience that scales massively, and provides a repeatable model for high-stakes, high-engagement, high-impact learning. eXact learning solutions helps organizations to achieve digital transformation in the way they reuse, author, manage and deliver digital content. eXact's content life cycle care solutions include collaborative content creation, structured and workflow-based content management, and multiple output delivery of content in any desired format. For those who want to build robust, interactive lessons and simulations, our content authoring solution is for you. By tightly integrating with the content management system in our platform, you can achieve unprecedented richness in your lessons while making administration easier than ever before. The Training Arcade™ is an intuitive game builder that enables anyone to create, publish and share training games as a stand-alone URL or as part of a learning management system (LMS). This platform transforms training from passive to active and enhances e-learning, m-learning, and instructor-led training while providing robust analytics. gomo helps L&D teams around the world make the e-learning production process efficient, collaboratively. With authoring, hosting and analytics, and video, whether you already have a huge learning infrastructure or absolutely none at all, gomo saves time, effort and money while supporting more dynamic, scalable and seamless learning. Trivantis® is the award-winning creator of Lectora® for authoring and CenarioVR for VR authoring and immersive learning. As an industry leader of learning accessibility, Trivantis serves clients across the world, including global enterprises, government agencies, educational institutions, and other entities. MOS Chorus LCMS enable the creation of RAID (rapid agile instructional design) online and in collaborative mode. MOS Chorus LMS enables “Haute Couture” portals (full customization of learners’ environment). As part of our commitment to continuously monitor the training marketplace for the best providers and services we announce the 2019 Authoring Tools Training Companies Watch List. 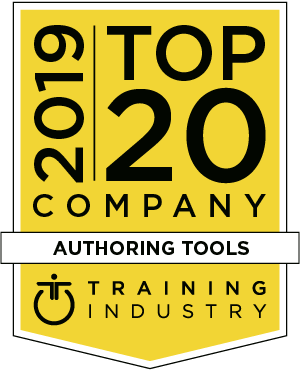 The 2019 Authoring Tools Training Companies Watch List is intended to help buyers of training services evaluate authoring tools providers, representing emerging or unique strengths or capabilities. Due to the diversity of services included in leadership training, no attempt is made to rank the top companies. ClickLearn creates user instructions, e-learning and process videos for business software. Deliver eight different learning formats. ClickLearn auto-upgrades all your learning materials to newer or changed product versions. Easygenerator is a cloud-based e-learning authoring tool that enables subject matter experts to rapidly create and share engaging e-learning content with the highest learning impact. The tool is used and loved by over 1000 customers in more than 40 countries, including at major enterprises such as Nielsen, T-Mobile and Unilever. Coassemble is an integrated online training platform that combines intuitive cloud-based authoring with the functionality of a learning management system. With Coassemble, anyone can create engaging e-learning content in minutes, and share that content from a single integrated platform. isEazy was founded in 2017 as an idea from within the Bizpills Group, a natural evolution to cover the many needs that our clients told us about and still tell us on a daily basis. Over the last 15 years, we've worked with all kinds of companies (large corporations, universities and SMEs). Our authoring tool, MyEcontentFactory, gives you the ability to free your existing content to be reused across print and digital formats. Our user-friendly interface, collaboration tools and template library make it easy to build and launch new projects in a fraction of the time it typically takes with traditional tools. simpleshow's recipe for success is a sound methodology combined with creative heads and hands to deliver the most effective explanations. With mysimpleshow, we have condensed all our experience in corporate storytelling and audiovisual content creation to provide a highly efficient tool that allows users to create professional results in minutes.